Photo courtesy of Amy Liu. Pencil case found in China. This case is actually a weapon against artificial intelligences that are unable to deal with paradoxes. Perfect gift for your little Nihilist. OK, so this pencil case was found in CHINA? As in Mainland China? The PRC? The pencil case was clearly manufactured by a Japanese company for Japanese consumers. 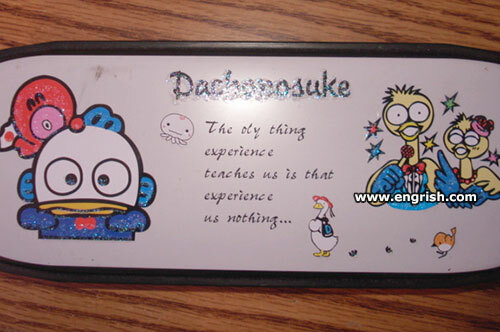 “Ducknosuke”. Or, a misspelled “Dachnosuke? Third, why is the little pink Octopus waving a fan with the Japanese national “Hinomaru” (Rising Sun) Japanese flag? I’d think this would encourage the average Chinese mainlander to start stomping all over the pencil case in hatred (that famed Chinese hatred of Japan and anything Japanese) rather than buy it for their one child. If this pencil case was from Taiwan, then I could see it. Taiwanese are less anti-Japan than the mainlanders. A pencil case wrapped in an enigma…..I guess. If he’s Asian, it possible is next to nothing. Dach (Deutsch) = top or roof. ie Hausdach = house top. So he could be a “top” nosuke. Well! Stuff em. It’s ‘Darn old duck’. Not only do the pencils have no points. Neither does the text have a point. BTW. It seems to be instructing the kids about the birds and the bees. Come and see Donald and Daisy -uck. Do they have karaoke in China now? And has for quite a long time. So does S. Korea. So does Taiwan. Except in Chinese it’s pronounced kah-lah-oh-kay. Why would the Chinese NOT have karaoke? @Pete above. One may have hoped, (In vain) that the Chineesee had better taste. And as I’m sure you know, Pinoys & Pinays can’t live without Karaoke. It’s just NOT a party for Filipinos if there’s no Karaoke. @Pete. My range is in the Paul Robeson – Johnny Cash key. So! I did a rendition of Joe Hill. One, they were mystified as to what it was about, and two I nearly blew the bass speakers out of their karaoke machine. Well, that’s ONE way to achieve the objective!